WordPress themes with many features are great. You can build different types of websites using the same theme on each site and customizing it until you’re happy with the result. In my experience these themes need a bit of time to understand and learn their custom admin panels to set up each feature. But in some situations you need to create just a simple WordPress website, a small blog for your sister or a portfolio for one of your clients who is a photographer. And you want to create it fast! In these cases a simple WordPress theme, maybe with a clean and minimal design, and with just the essential features, would be the best choice. And the themes that we’re going to review in this article are just like that! Simple in design and features, they’re some of the best premium WordPress themes of this type that you can use for a personal blog, a portfolio or a business website. Some of them have been released in the last year and some in previous years but are updated often and are still very popular among the WordPress community. Let’s take a look right away! Ever is a clean and simple theme by Themewaves. It comes with 10 Home page options: Grid, Box, Box Mini, Featured, Metro, Fullwidth, Masonry, List, Big and Grid (dark). There are over 9 different single post styles and 4 blog layouts, for you to choose from and customize everything as it best suits you. Included are more than 600 Google Font options and it has different typography options for both body and heading. There are three pagination options (Infinite, Normal and Numbered) and it comes with extensive options. These will give you complete control over what goes where and how everything looks. This theme is easy to customize and it is built using Bootstrap 3x. It is a responsive theme, as well as widget ready. Atik is designed by Codestag and it is a versatile theme that you can adapt to your needs. Whether you want to have your own blog or run an online store, this theme makes it possible. For the bloggers, there are three layouts available. The design is minimalist, everything will look neat and organized. If you want to set up an online store or just sell handmade merchandise, then you can easily do so, since this is a WooCommerce compatible theme as well. There are 6 custom widgets, which can be combined to give you flexibility in customization. Everything will look just as you picture it. There are numerous Google Web fonts that you can choose from, to transform the way your posts will look. This is a responsive theme, that is also compatible with WPML, for international visitors. The code is easy to work with if you are a developer and there is highly-responsive support, if necessary. 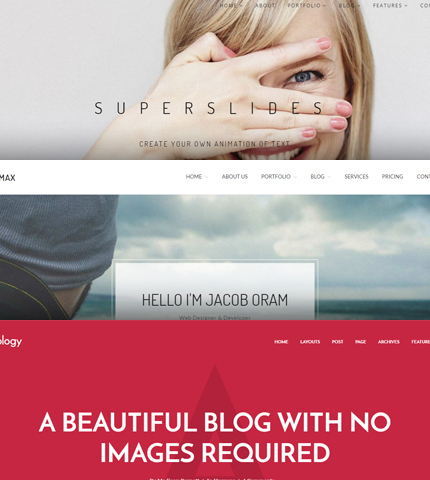 Simple Article by GoodLayers is a minimal theme designed for bloggers. It comes with Page builder, with a Settings shortcut button, so you can easily get to work with it. This is a great blogger theme as there are numerous features that make it customizable and very reader-friendly. You can add Parallax background and select the colors you want to be on the pages and posts. Adding YouTube videos as background is also possible, while disabling the header and footer, to make it full-view. It is fully responsive, so your readers can visit the blog from any device. There are 4 blog styles to choose from and each can be customized to preference to the smallest detail. Another plus is that it is WooCommerce ready for online sales. There are demo options available if you’d rather spend less time on it, if you are a beginner. Event managers, this next theme is for you. Meet Venue X by ThemeCanon, a simple events theme that allows you to organize events and showcase photos. You can add media and sell tickets to those interested. It comes with over 700 Google Web fonts and more than 675 Font Awesome icons. The 240 Flag icons will make your site easily accessible to international readers in numerous languages. There are 28 fully customizable Page Builder blocks and more than 40 Header builder options, for complete control over the design and look of your page. You can easily integrate adds, create a single or multipage site that is Retina ready and fully responsive. The background is customizable and it can also be made clickable for ad campaigns. There are 4 different gallery styles (Isotope, Masonry and Flex slider galleries), for images, videos and audios. It has 2 blog layouts and supports several different post formats. Apart from all that, it is SEO optimized, with Google Analytics integration and Twitter, Facebook and Instagram widgets included. Those looking for a simple minimal blog theme will absolutely love The Thinker by Anariel Design. The name alone is a good start, which combined with the features is the complete package. This is a fully responsive theme that you can customize using the theme customizer for picking different colors, adding images, changing logos and plenty more. There are different page templates that you can play around with, for a blog site that is “you”. It features several plugins and widgets, one of which is Jetpack. One of the Jetpack’s special features used here is “Jetpack Portfolio” that allows you to create custom portfolio posts and be free to get as creative as you can. To kick your blog up a notch there is the Soliloquy slider plugin for creating beautiful sliders. There are also two custom menus and of course, the Easy Google fonts plugin to change fonts and the look of your posts. Also for bloggers, DashBlog by Hercules Design is a more advanced theme that suits both amateur and professional blogs. It comes with over 60 home page variations and 5 built-in header layouts, 9 custom page templates, different post layouts and 9 post formats (Aside, Gallery slideshow, Gallery grid, Link, Image, Standard, Quote, Audio and Video). There are 9 custom widgets, built-in Log in and Subscribe page, as well as Mega menu. You can easily link Instagram and it is also integrated with WooCommerce for different sales. The image gallery is categorized and you can choose 2, 3 or 4 columns to display everything as preferred. Lightbox is also integrated for image display. It is a responsive theme that will display beautifully on any device and will allow you to share your stories and adventures with people around the world. Collective is a portfolio theme created by Kubi Studio, for those who want to display their work and projects in the best way. It is a simple theme, designed to be clean and minimalist so the focus will be on you and your work. Despite it not having a lot of features, the essentials are all there and they are more than enough. There is Visual composer, over 2000 icons, numerous theme options and different page templates available. It is translation-ready as well as widget ready. It comes with shortcodes and for those who want things done quickly, there is a one-click demo importer. If you are looking to set up shop online, this is a theme compatible with WooCommerce. And of course, it is fully responsive and Retina ready. Also a portfolio theme, Minimax by HasTech comes with lots of possibilities. There are 7 different Home pages, various other pages such as Blog, Pricing, Contact and Portfolio. The color options are unlimited and there is no coding required. Everything is done for you. It comes with Unique Design Bar for styling and customizing every detail of your widgets. It is blogger friendly and also WooCommerce ready. There is Google Analytics and Google fonts integration, as well as multilingual options. You have full control over how your page will look like, where everything goes and what each specific post will be like. Another great feature is the built-in support using Layers Messenger for live chat support. Smart is another portfolio theme for creating stunning displays of your art, work and photography. Whether you are a freelancer or an agency, this theme by ShTheme is what you have been looking for. It was built on Visual Composer, that allows you to create and organize unique looks to your page, by just dragging and dropping. There are over 600 Google Fonts that you can use on the header, footer, body and anywhere on the page. The theme options are very easy to understand and work with, but there is also an easy setup and demo importer. There are unlimited color options and there is Contact Form 7 included. For those familiar with coding, the HTML5 and CSS3 code is developer-friendly. A theme for those passionate about photography, Basic is a minimal portfolio theme by Caden Grant. It is 100% Responsive and SEO optimized. There are 3 blog layouts (Classic, Grid, Fullwidth) and 16 post layouts in different column and style options. You can create unlimited portfolio pages, each with as many pictures or posts as you’d like. This due to the infinite scrolling, that gives you freedom and control over how much you include on the page. If you are looking to not only showcase your work, but also make a profit, this theme is WooCommerce ready. For customization it uses WordPress Customizer so you can change colors, font size, spacing, fonts and plenty more. There are more than 500 Fonts, 3 custom widgets, shortcodes for styling and options to add different media, be it imagery, audio or video. Different in concept and design, Typology is created by meks for writers looking to have their own blog. It’s design is unique with stylish and beautiful typography so you can share your thoughts in the style that suits you best. This is a theme for those that love to write. Uncomplicated, no images, no videos, just text. It has an advanced option panel that will allow you to edit and style each post to preference. Everything can be quickly setup without too much fuss and you can choose from different pagination types. There are several custom widgets that add more functionality to the theme. There is built-in translation and also RTL support for worldwide users. You can update the theme in just one click and add different shortcodes to truly transform the look of your posts. The setup guide will teach you step-by-step how everything is done and there is also additional support. Next we have Arnold by BWSM, a portfolio theme for a professional showcasing of your work. It was built on Visual Builder and it comes with a custom drag-and-drop portfolio builder. You can create unlimited layouts, choose from unlimited color options and add different shortcodes. There are 7 post formats and 8 header layouts. The portfolio options allow you to arrange and place everything where you want it to be, so your page will look just like you envision it. There are two BM sliders included (Tab and Classic), options for adding custom logos, fullscreen background video, RTL options and child theme included. This is a flat-design theme, also compatible with WooCommerce. Tiffany is by GiaThemes, a theme for travel, food and photography lovers. It is a beautiful and clean design, with a minimalist approach. The result is an elegant blog that stands out. This theme is fully responsive and optimized for mobile view. For customizing you can use the WordPress Customizer that gives you freedom in personalizing and adapting everything to what you’d like it to be. Layouts can be easily changed, as can be the colors. You can upload custom logos and Favicon from the admin panel. There is Sticky header navigation, 3 blog layouts, 4 post layouts and different post formatting. It is a translation-ready theme where you can add text, pictures, videos and audio for an interactive blog. Lunaria is another versatile theme for creative people, travellers, vloggers, foodies and fashionistas. You can display everything beautifully using the default typography or select a custom one. The powerful admin panel is by Unyson framework that gives you complete control to edit even the finest details on your new site. Visitors can easily sign up for newsletters using the MailChimp widget so they can keep up with your adventures. There are numerous Google fonts to choose from and it requires no coding knowledge to customize and work with this theme. Those looking to turn their site profitable and get not just subscribers but real customers, Lunaria is WooCommerce compatible. This is a Retina ready and RTL ready theme, with responsive layouts that make your site accessible to everyone, no matter where they are. And if you want to run ads, it can easily be done with the Adsense manager that will keep track of everything. Colors by Themehaus is a colorful theme, where everything can be color-customized for a unique look. There are 5 different menus, 7 widget areas, 4 custom widgets and 3 page templates. The customizer is simple to use and you can modify different parts of each page and post. There is multilingual support and this is a highly responsive theme, with fast loading time and smooth display. If you are looking to customize the code yourself, you’re in luck as Colors comes with a clean code that you can easily work with. You can connect social media sites and display ads as well. Everything is detailed and the documentation is step-by-step for those just starting out.